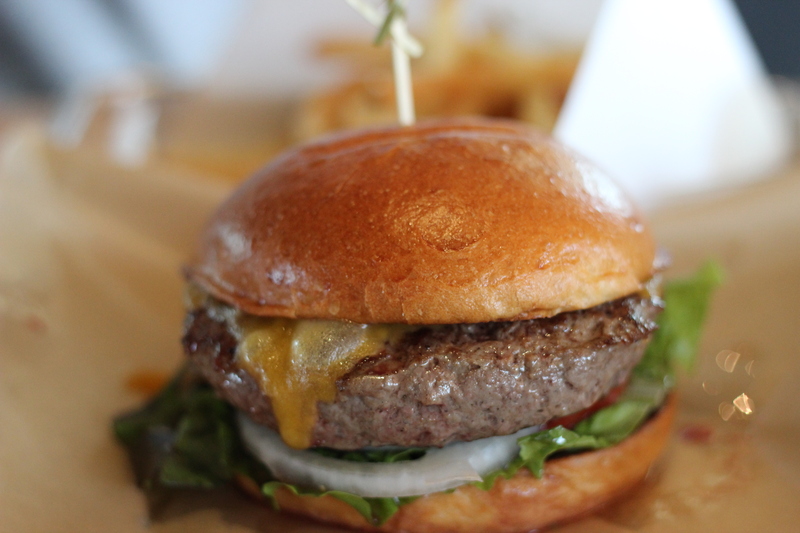 So the friend who gave my the tip about the Big-A** Burger at Roaring Fork, recently informed me about another burger joint here in Austin – Hopdoddy Burger Bar. For a burger blogger, I sure am horrible about keeping up with these burger joints around town. I blame it on the fact that I live right outside of Austin in a town called Round Rock, and all the happening stuff is in downtown Austin which is a bit of a drive for me. But no excuses – I’m gonna try my best to hit all the noteworthy joints and then some. Thankfully, Hopdoddy opened a location up north. I had some trouble deciding what to get as all 12 of the burgers on their menu sounded worthy of being devoured. I somehow managed to narrow my options down to four, but that’s when the real challenge began. The four contenders: 1) The Goodnight – Angus beef, Tillamook cheddar, hickory BBQ sauce, caramelized onions, sliced jalapeños and sassy sauce (a mixture of mustard, mayo and horseradish from what I hear) 2) Llano Poblano – Angus beef, pepper jack cheese, roasted poblano chiles, apple-smoked bacon, and chipotle mayo 3) The Classic Cheeseburger – Angus beef, red leaf lettuce, white onion, ripe beef steak tomato, sassy sauce, and Tillamook cheddar 4) Primetime – Texas Akaushi Beef, Brie cheese, truffle aioli, arugula, caramelized onions, and steak sauce. For fear of getting stuck in a line that is commonly known to extend out the door, I quickly decided on The Classic Cheeseburger. I figured I needed to know how they do the classic before trying anything else. Upon taking my first bite, I knew I was in for something special. The meat was seasoned just how I like it and cooked just how I like it (medium rare at places I trust). And the horseradish in their sassy sauce added a nice punch that kept the burger from getting too heavy in the mouth. The only negative that I can comment on is the fact that I nearly lost my bottom bun due to the juices of the patty and tomatoes. But are juicy meat and toppings (or bottomings in this case) really a bad thing?? The bun (while intact) had a nice bite and density to it. The fries were well-cooked and well-seasoned, thus pairing quite nicely with the burger. The Kennebec fries had a light, mild potato flavor. Although I didn’t indulge in one the artisanal beers they had on tap, I thought it was worth noting that they offer beverages from a dozen or so local breweries. In addition, they have salad bowls on the menu, but are you really here reading my blog to learn about salad bowl offerings?? I didn’t think so.